With the Dynamo or Solar Radio Flashlight you will never have to worry about dead batteries during a power outage. 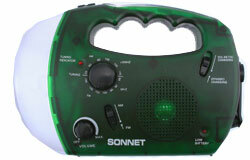 Although this combination radio and flashlight can use regular batteries they are not necessary. It can be powered by turning a foldaway hand crank or it can use sunlight to generate power. It performs three separate functions and is ideal for both indoor and outdoor use. The flashlight will allow you to see clearly outdoors at night or during a power outage. In an emergency, the siren and flashing light can be used to summon help. The AM/FM radio with built-in speaker and telescopic antenna provides great reception for listening to your favorite music or to official broadcasts during an emergency. Can also be powered by two AA batteries (not included). Dimensions are L 9" x H 6" x W 2 3/4".